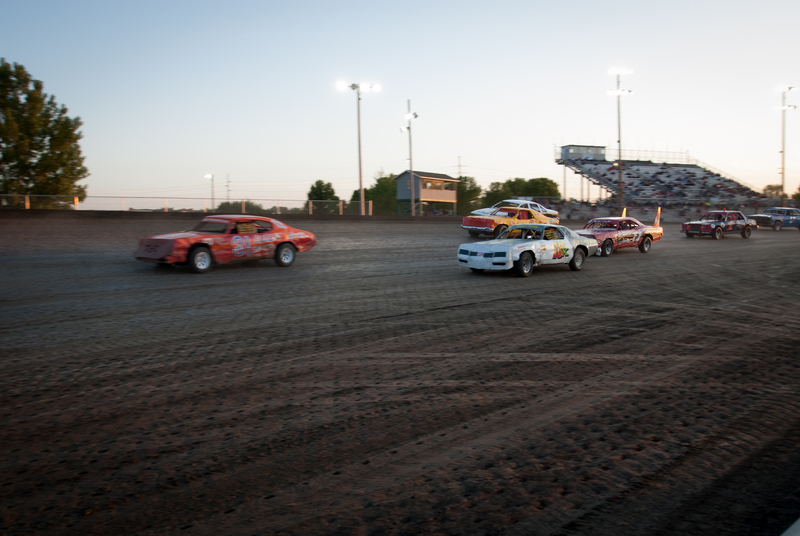 Dacotah Speedway, for the third night in a row, averaged over 120 cars each night! Last Friday, May 24th, was no different as drivers from all over the Midwest came to race the high banks of the 3/8's mile track. The cooler weather made for a smooth, fast track which produced some spectacular racing. 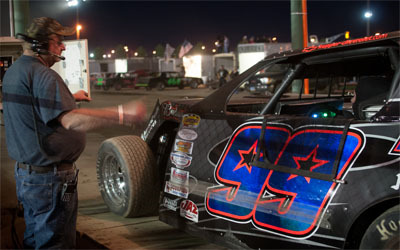 Two IMCA Modified concies kicked off the night after intermission. Only the top four from each concy would transfer to the feature. A complete restart allowed third place Spencer Wilson to slide into the lead in concy number one. Wilson pulled away from second place Tracy Domagala and third place Shawn Anderson. A caution for Larry Magstadt's spun car in turn four regrouped the field for a green-white-checkered restart. Wilson still managed to distance himself from the field to win the concy. Pole sitter Domagala finished a distance second ahead of Anderson and fourth place Donald Robinson of Underwood. Jeremy Keller started on the pole for concy number two. Keller pulled away as second place Darrell Bauer blew a motor on lap four. A lap five caution regrouped the field but it didn't slow Keller any as he pulled away on the restart. Aaron Turnbull, who blew his motor in his heat race, borrowed a spare car from Steven Pfiefer, battled his way into third. Turnbull raced hard with Kody Scholpp and took second place with three laps to go. Keller's lead started to diminish as Turnbull slowly caught him in the remaining laps but Turnbull ran out of time. Keller led all 12 laps to win concy number two over Turnbull, Scholpp and Troy Heupel. Jordan Hendrickson lead the field to the green flag in the Hobby Stock feature. Chad Hausauer, who started seventh, wasted no time as he lead lap one. Jeremy Engelhardt followed Hausauer's tire tracks all over the track. A series of quick cautions set up some great racing between Hausauer and Engelhardt for the lead, as they raced side by side for the lead with four laps to go. Hausauer held on to win his second feature of the season over Engelhardt. Scott Gartner, who quickly fell to the back of the field with a wounded car raced his way back into the third position. 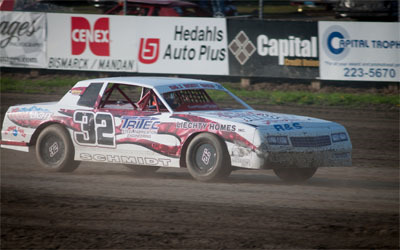 Ben Meuchel made a last lap pass to finish fourth ahead of Terry Dschaak. Pole sitter Travis Ulmer held onto the lead in the WISSOTA Street Stock feature. A strong Jeremy Schmidt battled hard with Ulmer for the lead as they raced side by side for several laps, swapping the lead. As they battled, it allowed John Feist, David Falkenstein and Chris Serr close in on the leaders. Ulmer over drove turn two with eight to go, dropping him from second to fifth. Schmidt's large lead quickly disappeared when a caution with three to go set up a green-white-checkered shootout. Schmidt had the car to beat and went on to victory, picking up his first feature win of the year in his first full season back to the Dacotah Speedway. Chris Serr passed Falkenstein on the restart to finish second. Dickinson's Eric Paul finished fourth ahead of pole sitter Travis Ulmer. 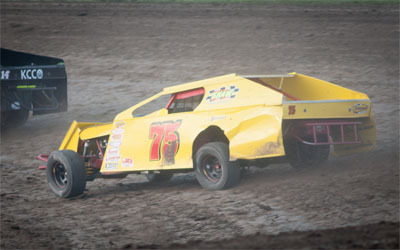 Travis Olheiser quickly lost the lead to Brian Swenson in the IMCA Modified feature. Swenson and second place Troy Girolamo distanced themselves from the rest of the field. Their lead on the field quickly disappeared as a storming Shawn Strand climbed from ninth to third in six quick laps. Strand caught and battled with Girolamo for second. A caution reset the field and on the restart, Strand took it three wide for the lead only to shuffle into the lead and pull away. Swenson started to drift backwards, losing positions to Girolamo, Marlyn Seider and Mark Dahl. Minot's Steven Pfiefer made a late race charge into the top five. Pfiefer, the second fastest car on track, quickly climbed through the top five passing Dahl, Seidler and finally passed Girolamo with five laps to go. Girolamo fell into the clutches of fourth place Dahl but held on to finish third. Pfiefer finished a distant second behind feature winner Shawn Strand. Jeremy Keller rounded out the top five. 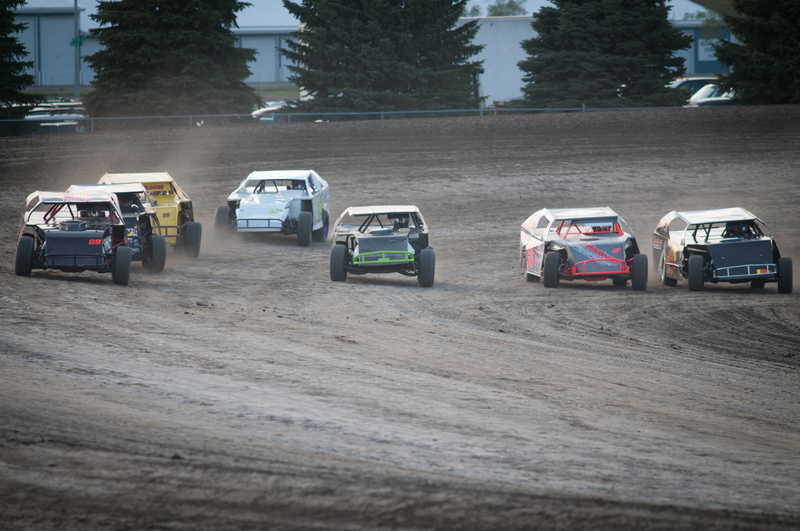 WISSOTA Late Models made a visit to the Dacotah Speedway last Friday. Thirteen drivers, including last year's national champion Chad Becker, braved the weather to race and they were not disappointed. Sydney, Montana's Hank Berry started on the pole but Steven Pfiefer stole the lead away on the start. Berry had to fend off Rapid City's Mike Stadel for second. Coming out of turn two, Berry got loose, allowing Stadel to grab the second position. Stadel's march to the front continued as he reeled in leader P fiefer with 10 to go. Bad luck hit Pfiefer as he hit a piece of debris on the track and cut a tire, ending his chances of victory. Stadel inherited the lead and battled Berry on the restart with nine laps to go. The high line around the track gave Stadel's car the advantage to hang onto the lead. As Stadel pulled away, Berry, Becker and Keller raced three wide for second. Keller shuffled into the second position where he would finish behind winner Stadel. 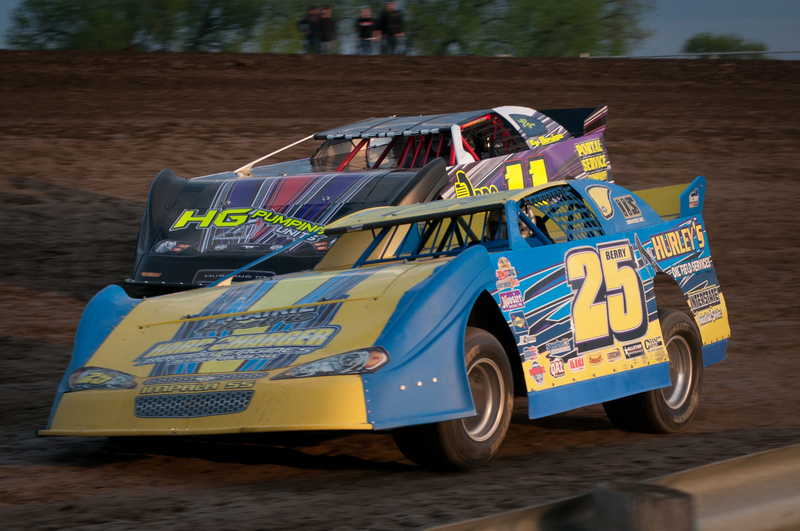 Berry held off last year's WISSOTA Late Model national champion Becker for third and Mark Dahl, making his late model debut at the Dacotah Speedway finished fifth. The IMCA Sport Compact feature finished the night. Nic West grabbed the lead from pole sitter Jamie Schlafmann. West's built a large lead early but saw it quickly disappear when Schlafmann and third place Derek Nitschke chase him down. Schlafmann bumped West out of the way to retake the lead with seven laps to go. Schlafmann drove away to win her first feature win of the year. Last year's track champion finished second, almost 3.5 seconds behind winner Schlafmann. Rookie Nic West finished third ahead of Dickinson's Scott Hagemeister and Josh Roehrich. Friday, May 31st is Image Printing night. On the card, IMCA Modifieds, Wissota Street Stocks, Dacotah Speedway Hobby Stocks, INEX Legends and IMCA Mach 1 Sport Compacts. Fan gates open at 6. Driver draw cut off is at 6:15. Pit meeting will take place at 6:30 at the infield scale. Pit passes are $20, adult grandstand tickets are $11 and kids 12 and under get in for FREE! Advance, discount tickets are available at all Cenex locations in Mandan, Bismarck and Lincoln. 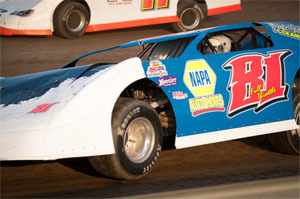 For more information visit us online at http://www.dacotahspeedway.net/ and "LIKE" our Facebook Page. 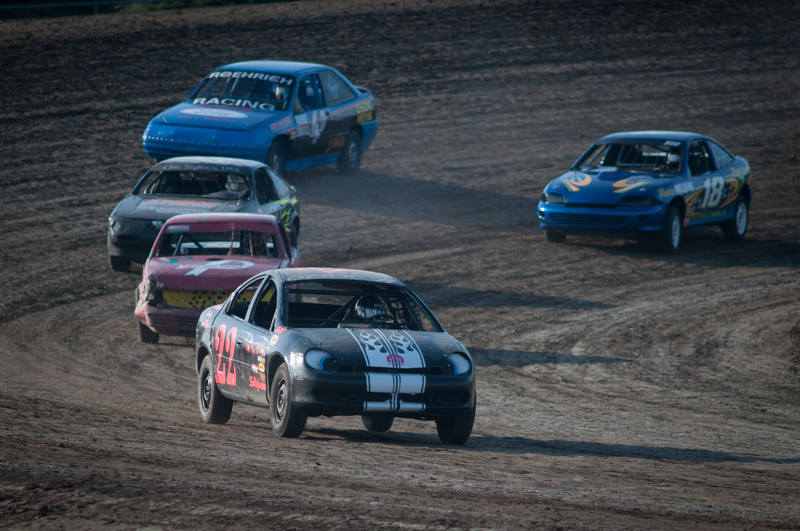 You can also follow us on Twitter @dacotahspeedway.